Obajana, 09 April 2018 – LOESCHE is contributing to the new cement production line of the Dangote Cement plant in Obajana in Kogi State, Northern Nigeria with the delivery of two vertical roller mills (VRM). With a total capacity of more than 12 million tonnes/year, this plant, owned by the leading cement producer in West Africa, is currently not only the largest cement plant in Nigeria but also the largest cement plant in all of Sub-Saharan Africa and also one of the largest worldwide. In the Schwarze Pumpe Power Plant in Germany, the LM 35.3 D has been in operating successfully for many years. 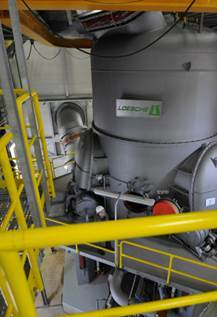 LOESCHE's order for the new production line 5 in Obajana comprises a high performance 6-roller mill for cement raw meal with a capacity of 580 t/h – the largest roller mill for raw material in the LOESCHE range. The order also includes a large 3-roller mill with a modular design featuring a drive power range of 1,000 kW for grinding hard coal and lignite with a throughput of up to 70 t/h. In addition to the two complete VRMs, the LOESCHE scope of delivery also comprises the respective classifiers for the type LDC for cement raw material and the type LSKS ZD coal mill, which is characterised by individually adjustable grain size separation. The two mill gear units are equipped with state monitoring and remote access for remote monitoring. Moreover, LOESCHE is contributing to the design and planning of the entire plant as well as the engineering for the electrical measurement, control and regulation technology and complete automation. The delivery date is scheduled for the third quarter of 2018. The raw material mill is equipped with the highly resistant metalmatrix-compound (MMX) technology which guarantees a very long service life. The contract partner for this project is again the Chinese company Sinoma International Engineering Co., Ltd. which has already installed a total of seven clinker and cement raw meal VRMs for the Obajana plant in close cooperation with LOESCHE in previous years. There, and with its two other production facilities, Dangote Cement achieves a total capacity of 19 million tonnes/year today. With the extension of its production capacities, Dangote is contributing towards Nigeria's aim of extending cement production capacities in order to meet the current growth in demand and to reduce the country's dependency on cost-intensive imports. Not least for this reason, Dangote Cement has invested a total of at least 4 billion US dollars here in previous years.